It was more than a decade ago when I stopped believing my own fantasies of finding happiness by leaving my marriage. I could see that those dreams were only substitutes for taking a hard look at who I was. Depression, though, made that difficult task even harder by convincing me there was no one worth knowing in this mind and soul of mine. I had a dream at that time full of images of shame that took the form of people speaking in my own depressed voice all the messages I kept sending to myself. I sat shrinking in the corner of a big room, and each of them came in turn, looking twice their normal size, to tell me what a mess I was. The gloom of that dream woke me up. I could see so clearly how my psyche was devilishly busy turning my own thoughts into hammer blows to drive me deeper underground. Something snapped, and I was suddenly alert with purpose to fight back against that force trying to kill me. It was the same powerful feeling that woke me up from depression during an earlier bout with cancer. I wasn’t going to let that darkness prevent me from rediscovering who I really was and rebuilding a close relationship with my wife. But exactly what do you do to regain this closeness with your partner? In my case, I started a process of working through the layers inside me that were hiding whatever core remained after years of depression. Some of this I did on my own, much more by working with a therapist, often together with my wife. Most important, though, were long, close talks with her, usually in the midst of an excitedly sleepless night when we could finally get through to each other. In those moments, we could at last find words to capture honestly what we were feeling. After a number of crises and years of effort, we made a breakthrough and had the experience of falling in love all over again. That gave us hope for dealing with the inevitable lapses and recurrent bouts of depression. In our experience, intimacy is not a state to be reached and shared forever after. Largely because of the impact of my depression on both of us, the process works for a while, breaks down under the pressure of illness as trust is lost and then has to be rediscovered. What improves during each painful cycle is the personal awareness and skill set we both need to separate out the different problems that combine to a storm of crisis. Like many therapists, they recognize that couples often reach an accommodation at this level of a personality-centered relationship. Partners establish a basic agreement about how they view each other, strike a fair balance or reciprocity between them, rebuild trust and find mutual acceptance. Unlike most therapists, however, they move beyond that to ask deeper questions aimed at taking down the defensive structures of personality to get at fundamental needs of each partner that help them achieve an inner peace and sense of wholeness. That can be a scary business – dissolving the defenses to direct feeling and experience that have built up over a lifetime. They refer to this as entering the “black hole” where life can look bewildering and frightening at first. Once there, on the other side of that black hole, two people can achieve a sense of peace about who they are that enables them to experience each other with compassion. Without the blinders and fixed reactions of a defensive personality, each can respond with spontaneity more directly to daily life and to one another. The need to reach deals and accommodations is gone because each feels an inner security that enables them to be open to whatever may come. That’s an ideal to work toward, and it may sound too good to be true. These writers recognize that this isn’t a one-time victory but a life commitment. Undefended intimacy can only be achieved after hard and frightening work that too many people will simply refuse to do. If the commitment is there to do the work by this or another method, I know that incredible closeness can be reached. I also know from experience that it will be threatened by the reassertion of old personality habits and lost. 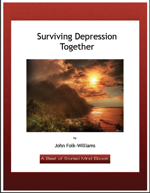 In my case, it can disappear with a resurgence of depression all too quickly, and then it’s the same hard road to get back – though at that point my wife and I have the knowledge that it is possible. The key thing is to cultivate a set of inner habits and tools for counteracting defensive ways of feeling and thinking. The reality for us is that we spend most of our time on the road toward or coming back from that place of harmony. As long as the commitment remains, we know there’s hope of getting back. It takes a strong personality to look within in regards to relationships. All too many people walk away when the going gets a little rocky, and they certainly don’t hang around when the going gets really tough. I can’t say I’ve ever been in the position where I’ve fought that hard to save a relationship. Since the death of my partner, going on seven years now, I haven’t been in a relationship at all. I am, however, a child of divorce and I watched how my parent’s marraige ended in a bitter blaze of fire and brimstone. It certainly leaves a lasting impression. I think your commitment, even during those dark depressions, is something rarely seen these days. It would be nice if more people worked towards saving their relationships in a similar way. What a great question. I’ve become more and more aware of how depression is affecting my marriage. And my wife has been pointing this out to me as well. I too ask the same question. It seems that closeness is about being able to be vulnerable and yet the world we live in (depression) is something most do not understand and hence our vulnerability sometime only results in greater pain than closeness. If you have answer, I would love to learn more.